Choose Your Own Venture | News and Features | Style Weekly - Richmond, VA local news, arts, and events. Can Richmond become the next Austin? You decide. 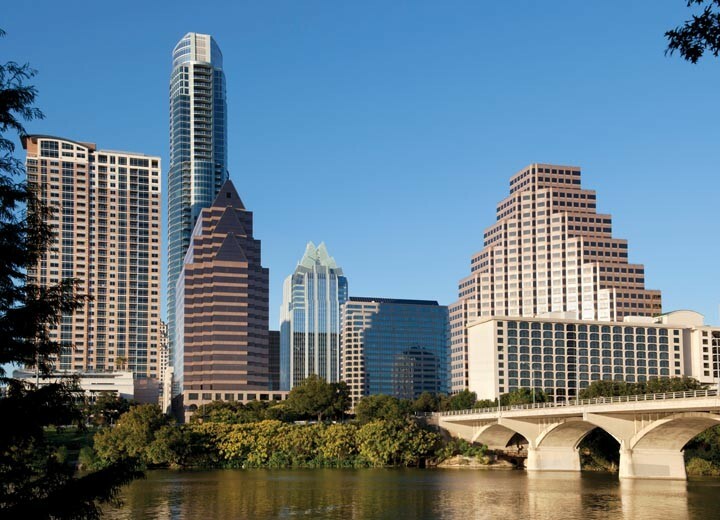 The Austin skyline: Last week, Richmond officials and civic leaders descended on the Texas city to borrow ideas on boosting culture and commerce. b) A costly field trip that yields little actual change in Richmond. Got it? Soon your true opinions about Richmond progress will be assessed scientifically, and you'll know whether what you feel is enthusiasm or despair. AUSTIN, Texas — One-hundred fifteen representatives from Richmond businesses and government are in Austin for Intercity Visit 2011, the Greater Richmond Chamber of Commerce-organized annual pilgrimage to [mine for ideas / appear progressive] in other cities. It's a busy two and a half days, with visits to City Hall, the redeveloped former airport and the University of Texas, plus off-duty jaunts to see local music and sample the culture. The Richmond contingent includes city and county officials, representatives from Mayor Dwight Jones' office, Venture Richmond, Dominion Resources, Wachovia, Virginia Commonwealth University and [members of the finance and legal community / the obligatory batch of lawyers and accountants]. They all stay at the W Austin Hotel, right at the corner of Lavaca Street and Willie Nelson Boulevard, a slick concrete-and-steel affair that feels more like a [Swedish nightclub / Finnish brothel]. The hotel sits in the center of downtown, where a lot of the city's famed live music can be found, and its presence exemplifies the conflict between the high-end residents who want some quiet and the very music culture that first made the city attractive to those people with money. It's a debate that Richmond [faces head-on / legally and politically bungles]. On the first day, after lunch in one of the W's [meeting rooms / studios], Austin Mayor Lee Leffingwell says he's glad the contingent gets to see Austin before the heat arrives, during what he calls "chamber of commerce weather." It's a reminder that a lot of what makes a city tick is how it thinks of itself, which stems of course from [a strong sense of self / effective branding]. Austin is known as the Live Music Capital of the World, a title it more or less granted itself. "We know that's true because the City Council proclaimed it," Leffingwell says, to knowing laughter. But then it had to live up to its name. During two decades it did, culminating in more than a hundred live acts nightly and two major events — South by Southwest and the Austin City Limits Festival. The festivals alone bring in $200 million annually. Richmond's most recent branding attempt, the Venture Richmond-backed RVA Creates, invites locals to design their own "RVA" logo within a provided template [to showcase both the city's diversity and solidarity / , though "RVA" seems more like an ad campaign than "Keep Austin Weird," which genuinely distills some essential part of that city's existing identity. "RVA" seems like it's trying to slap a label on a product that isn't finished. Austin was weird before the slogan; "RVA" is like that kid who gives himself a nickname when he gets to high school, whether or not it means anything]. Another slogan is "Keep Austin Weird," and encompasses the total embrace of culture here, from cowboys and hippies to tech millionaires and bass-playing hundredaires. The Richmond contingent seems excited to explore this concept, [to try to use a similar mantra in their hometown to develop a rich medium for culture, varied and undefinable as it is / but Mayor Jones, the old killjoy, shares his opinion in a debriefing at the end of the second day: "As long as we don't call Richmond 'weird,' I'm OK with that"]. The weirdness, at any rate, bubbles from the many opinions about the city that are out there, and the willingness of Austinites to [get involved in that discussion / slog through an endless series of fights]. "We're tolerant until you disagree with us," says the Greater Austin Chamber's president, Mike Rollins. City Council meetings are open to all and can last 12 hours (sometimes people get up and sing). Everything is a fight in Austin, Rollins says, and so progress is the gold that's sifted out of those dust-ups. The values that emerge emphasize preservation of green space, catering to young people (it's the fifth youngest community in the country), education and small business. "Our small businesses are really the largest source of our employees," says Mayor Leffingwell, and then, proving that one of Austin's main exports is mottos, adds, "In Austin, small business is big business." Richmond is similar to Austin in many of these respects [and has the same potential for a robust and progressive economy and culture. Companies big and small are growing there, and Richmond culture's received a boost of late with CenterStage, the renovated Virginia Museum of Fine Arts and the establishment of a Broad Street arts district. / but there's not enough of that fighting and community involvement, not enough passion about every single issue to distill a real identity, weird or otherwise]. Tim Davey of the Timmons Group says that in Richmond it boils down to commitment: Austin jumps in with both feet; Richmond, he says, "jumps in with water wings." Scott Sutton, director of business development at Froehling and Robertson Inc., who's been on these trips since 2002, says he sees it as a self-esteem issue: "Richmonders, we have the same freaking passion, but we beat ourselves up all the time." This relationship between a city and its creative engines becomes clear during a roundtable at Austin's City Hall featuring members of the city's music community. Despite whatever title Austin's City Council gave to the city, its music scene wasn't a respected and essential part of the community until, as Casey Monahan of the Texas Music Office says, "everybody in the music industry came together and they defined a shared agenda." The music industry became a multimillion-dollar business in Austin, and the landscape changed around it. "Where we went wrong — and we did a couple of times here — is there was no dialogue between the chamber and the city and our creatives until very recently," says Paul Oveisi of Austin Music People. "And I'd venture to say our creatives did well in spite of those institutions and certainly not because of them." Still, the Richmond contingent is involved and seems interested in all the panels, from public-private partnerships to the economics of creativity. Rose Reyes of the Austin Convention and Visitors Bureau has some advice for the Richmonders gathered here during the music panel: "Look at what's already happening in your community and help them out. Help them grow, whether it's a music festival, or whether it's a scene that is bubbling up." If the Chamber of Commerce's annual excursion is valuable at all, it is as an insight into those who run things around here.